The Mindfindr assessment service provides additional information to support professional and career planning. Career planning is often perceived as being related only to career choices after primary school. However, the current accelerated change in occupational structures - alongside changes in the life situations of individuals - leads to career planning becoming relevant also at other junctions over one’s lifespan and work life. Life experiences and changing values with other motivational factors may cause individuals to search for new careers and fresh opportunities in the labor market. Suitability assessments may be utilized to facilitate professional development of personnel, and more generally to smooth the processes of personnel relocation and resource allocation when organizations implement structural changes. Self-knowledge and an ability to recognize and even assess or evaluate one’s abilities and basic personality features yield essential information when an individual is planning for new careers. Sometimes individuals may have over-optimistic or unrealistic expectations due to lacking self-knowledge. Suitability assessments may thus prove very useful even if the results are not desired. It may be suggested that in those situations the information is especially relevant in saving time and energy, redirecting the career planning of the individual to optimal directions, besides increasing the person’s self-knowledge and understanding of one’s weaknesses and strengths as they relate to various professions and positions. It is also important to consider an individual’s current and desired level of education to decide how much the individual may have to or how much the person wishes to invest in formal training and education. 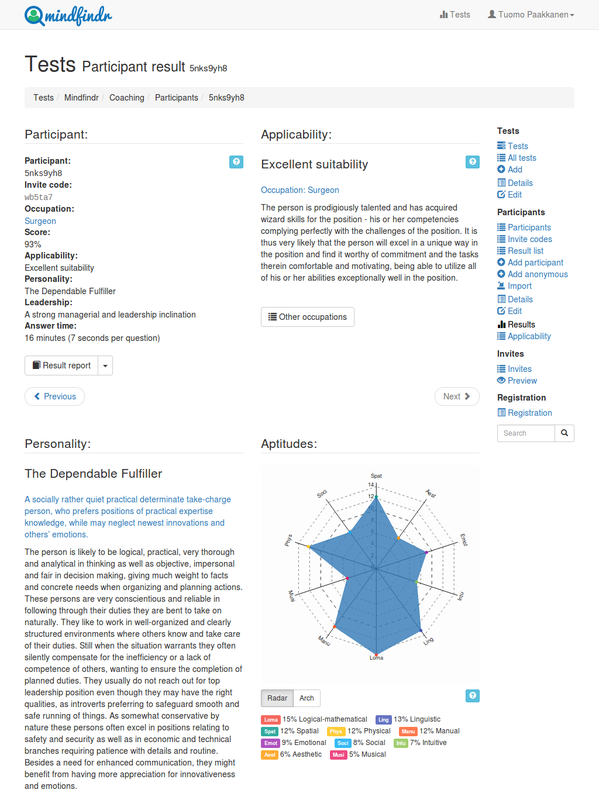 Besides a concise description of the respondent’s personality features, strengths and challenges, the Mindfindr report describes the person’s current potential for leadership and managerial positions. The picture below presents an imaginary example of a very exceptional profile that would allow a person featuring the described abilities to succeed either as a surgeon or as a fighter pilot, besides other optional careers. Both these jobs require going through higher education, the surgeon’s job in addition requiring completing medical specialization and academic continuation training. On the other hand, if a person possessing these kinds of qualities wishes to enter a practical occupation after a short training, he or she could very likely become e.g. a successful machine operator or an engine driver making important decisions autonomously and taking charge of difficult transport operations. Picture. A participant profile for a surgeon's position. It is noteworthy that occupations and professions with different training requirements alternate in the list, while in all these positions the professional may not be able to rely on any outside help or assistance but must rely on him or herself when making important decisions. In addition, any person not up to these job specifications may cause harm or even danger to other people, whether they be e.g. patients or passengers, an unsuitable or unqualified person hence risking also his or her own health in pressurized work situations. While various tests and methods like Mindfindr facilitate processes of estimating and making conclusions on a person’s suitability for a position, it must be borne in mind that any one estimate is not the whole truth. The more demanding a task the more the hiring organization and the person applying for the position should find out about the compatibility between the tasks and the person’s potential and strengths allowing one to take on the job - remembering that the person also changes and can further develop one’s competence potential. When completing the suitability assessment test, it is important to follow the test instructions. The report information serves primarily the career planning purposes of the respondent, so it is worthwhile to adopt a fair and honest approach to the questions in the test. Young people may understandably be unsure of themselves and hence make their career choices based on uncertain information and vague ideas. Career choice may also be influenced by, for example friends' and peers’ opinions. It is certainly useful to discuss career plans with people who know one, e.g. with family members, close friends and study counselors. "Choosing a career is one of the biggest decisions in life"
A primary aim and the purpose of work life coaching and occupational counseling is to help clients to make as rational and sensible choices as possible based on their strengths on the one hand and the prospects of working life on the other hand. Motivation and a genuine interest in an occupation or a profession often guide these decisions very strongly. In addition to these important aspects, more objective information is needed concerning one’s suitability as well as on the trends and options in the current and future labor market. Career choices based on the consideration of more objective factors besides subjective interests and opinions reduce the likelihood of disappointments while supporting an individual navigating towards an optimal position in the labour market increasingly characterized by very specialized qualification and competence requirements. Mindfindr will help you find the most suitable professions and occupations for you. The Mindfindr assessment can be implemented in many different ways. For example, the test may be offered to the testees and users ultimately taking the test by directing them to the suitability assessment using the web form.